Saturday, April 27, from 1:30 p.m. to 3:00 p.m.
We are delighted that you are interested in Nashoba Brooks and look forward to welcoming you to our school. Every day, Nashoba Brooks students arrive at School excited to see their teachers and friends and ready to engage in dynamic learning opportunities. Welcome To Our Lower School! Our Lower School is full of joy and discovery. 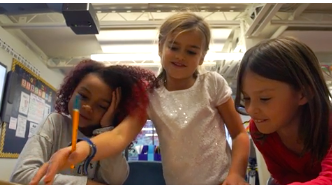 Students engage with friends and teachers as they learn about themselves and the world around them. They become adventurous learners and enthusiastic members of the school community. Welcome To Our Middle School! Creative, determined, inquisitive — these are just a few of the words that describe our Middle School girls. In Middle School, learning is a joyful enterprise with teachers who know and support their students' growth. Guided by our Core Values — integrity, collaboration, inclusivity, empathy, and resilience — and shaped by the work of our outstanding teaching employees and administrative leaders, the life of our School is rich in many ways. Through volunteerism and philanthropy, the Nashoba Brooks community insures the wellbeing of the School. Warren Berger, an expert in design thinking and innovation, has studied hundreds of the world’s leading innovators, designers, education leaders, creative thinkers, and entrepreneurs to explore how they pose questions, solve problems, and create new possibilities. Warren Berger is the author of the international bestseller Glimmer: How Design Can Transform Business and Your Life (Penguin Press; 2009). His book, A More Beautiful Question, inspired professional development for all employees at Nashoba Brooks School. It inspired thinking; it compelled discussion amongst colleagues, friends, and family; and yes, it led to more, better, and deeper questions. Dr. Elizabeth Englander is the founder and Executive Director of the Massachusetts Aggression Reduction Center at Bridgewater State University, a Center which delivers programs, resources, and research to more than 400 schools every year nationwide. As a researcher and a professor of Psychology for 25 years, she is a nationally recognized expert in the area of bullying and cyberbullying, childhood causes of aggression and abuse, and children’s use of technology. Each year Dr. Englander trains and supervises graduate and undergraduate students and collaborates with multiple agencies around the State of Massachusetts and across the nation. Michele Gay is the Co-founder and Executive Director of Safe and Sound Schools. Following the tragic loss of her daughter, Josephine, in the Sandy Hook School tragedy, Michele joined Sandy Hook mother Alissa Parker to establish Safe and Sound Schools as a national resource for school safety. Michele travels across the country sharing her message of inspiration, recovery, and school safety education and advocacy. She conducts school safety workshops and seminars, presenting Safe and Sound’s school safety model and resources, and facilitating school safety development in communities across the country. Debby Irving, author of Waking Up White describes herself as “a white woman, raised in Winchester, Massachusetts, during the socially turbulent 1960s and 1970s. After a blissfully sheltered, upper-middle-class suburban childhood, she found herself both intrigued and horrified by the racial divide in Boston. We were fortunate to have Debby facilitate a day of professional development with Nashoba Brooks employees as we continue our work to build a safe, welcoming, and inclusive learning environment at Nashoba Brooks School. Jessica Lahey, a teacher, writer, and a mom, is the author of the New York Times bestselling book, The Gift of Failure: How the Best Parents Learn to Let Go So Their Children Can Succeed. This was our community summer reading book for Nashoba Brooks School, and it inspired our theme for the year of Reframing Failure. Jessica is a member of the Amazon Studios Thought Leader Board and wrote the educational curriculum for Amazon Kids’ The Stinky and Dirty Show. Grant Lichtman is an internationally-recognized thought leader on the transformation of K-12 education. He works with school teams to develop a comfort and capacity for change in a rapidly changing world. Since 2012, Grant has visited more than 125 schools and districts, published three books, written numerous articles, and worked with thousands of school and community stakeholders to develop unique and powerful visions and strategies for transforming education away from the Industrial Age and towards future-focused models of deeper learning. Born and raised in Caracas-Venezuela, Michelle Poler is a creative and passionate social entrepreneur, keynote speaker, fear face, and branding strategist. She is the Founder of Hello Fears, a social movement empowering millions to step outside of the comfort zone and tap into their full potential. She has spoken at TEDx, Google, INBOUND, Facebook, ESPN, Netflix, Procter and Gamble, Microsoft, Toyota, and many more. In 2017, she started speaking to the younger generation. Since then, she has empowered over 20,000 students at schools and universities around the world to live with courage, find their authenticity and embrace their growth paths. Rachel Simmons is broadly known for her research and publications focused on girls and young women. Her work is a great fit with Nashoba Brooks core values, and was part of the inspiration for our annual theme of resilience. Rachel Simmons is the author of the New York Times bestsellers Odd Girl Out: The Hidden Culture of Aggression in Girls, and The Curse of the Good Girl: Raising Authentic Girls with Courage and Confidence. As an educator, Rachel works internationally to empower young women to be more authentic, assertive and self-aware. Her most recent book, Enough As She Is, serves as a call to action for those who care for and about girls and young women. Dr. Catherine Steiner Adair, author of the award-winning book, The Big Disconnect: Protecting Childhood and Family Relationships in the Digital Age (cited as a Wall Street Journal TOP 10 Best Non-Fiction 2013), examines ways in which the wonders of technology and media change how children learn and grow, and shows parents and educators how to reap the benefits of tech while reducing the risks it poses at every stage of child development. As a school consultant, Dr. Steiner-Adair works with schools to help strengthen their school culture and curriculum. She has visited over 500 schools in the US and abroad, and spoken at conferences throughout North America, Central and South America, Asia, Europe, and the Middle East. Dr. Michael Thompson’s is a psychologist and internationally recognized author of nine books including including Raising Cain, Finding the Heart of the Child, and Best Friends Worst Enemies. He has also spoken with employees and parents at Nashoba Brooks on several occasions. In his book Homesick and Happy, Thompson includes a chapter entitled, “Off They Go: Eight Things You Cannot Do for Your Children”, in which he explains the eight fundamental things that parents want to do for or give their children, but cannot. Dr. Thompson’s sage wisdom is delivered with a down to earth realism that is both honest and reassuring. An educator with a background in psychology, Shelly Tochluk spent ten years as a researcher, counselor, and teacher in California’s public schools. She now trains teachers to work with Los Angeles’ diverse school population as a Professor at Mount Saint Mary’s University-Los Angeles and she works with AWARE-LA (Alliance of White Anti-Racists Everywhere-Los Angeles). With this group, she co-created a workshop series that leads white people into a deeper understanding of their personal relationship to race, white privilege, and systemic racism. During her visit to Nashoba Brooks, Shelly spoke to employees and parents about her research and her book Witnessing Whiteness. Richard Weissbourd is a senior lecturer in education at Harvard Graduate School of Education and at the Kennedy School of Government. His work focuses on vulnerability and resilience in childhood, the achievement gap, moral development, and effective schools and services for children. He is a founder of ReadBoston and WriteBoston, citywide literacy initiatives and he has written for numerous scholarly and popular publications. Weissbourd is also the author of The Vulnerable Child: What Really Hurts America’s Children and What We Can Do About It, named by the American School Board Journal as one of the top 10 education books of all time. Nashoba Brooks School is a coed Lower School from Preschool to Grade 3 and an all-girls Middle School from Grades 4 to 8 located in Concord, Massachussetts.